Tweetdeck, one of the best twitter apps that runs on Adobe AIR platform, lately has been giving problems with no updates and going blank after logging in, and the same in all the operating systems. And most of the users have tried reinstalling the app, or trying for any new updates or previous versions. But the actual problem doesn’t lie with the tweetdeck app but is with the Adobe AIR platform files, which are causing the problem. Delete that folder, and restart your Tweetdeck app. It would start working fine once again. If it doesn’t, then reinstall tweetdeck through Adobe AIR and search if the folder again has been created, if yes, delete it again. The 2nd attempt will surely make it work fine. This was for Mac OS X. I tried one with Windows but did not work fine, so will give it a try again before posting anything. THANK YOU!!! My Tweetdeck stopped working for 48 hours! Thank you!! The tutorials are really nice and till now i never came across this kinda problem , but was good post as i came across this and now i can fix it any time. I faced the same problem many times but i used to reinstall it but after reading this in fixed this problem. For, It didn’t work… The problem continue every time I restarted everything. I downloaded Adobe Air and Tweetdeck desktop three times! Thanks. That sorted a very stuck TweetDeck on my Mac. Tried this and it looks like it works. Would have been good to see a warningi n the post that it would remove your Tweetdeck configuration, your global filter settings, your columns, and log you out of the app. Still, good tip, thank you! 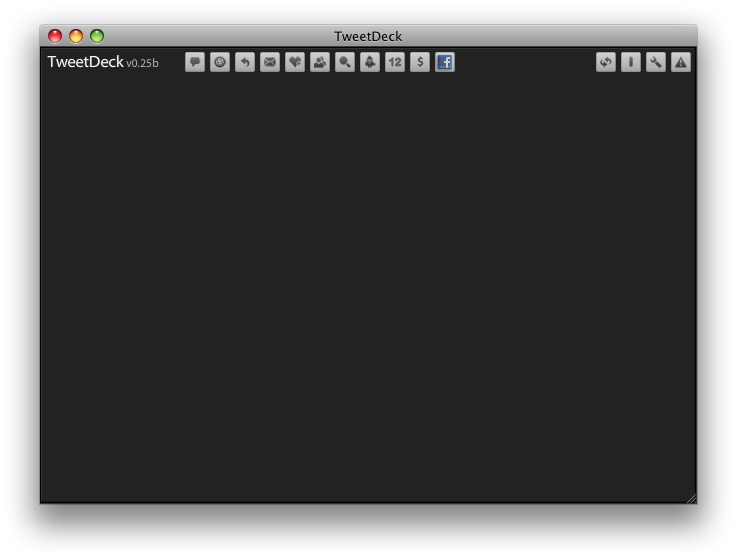 Tweetdeck not responding blank for 2 days now.